When you’re a hammer, everything is a nail, and Dr. Jordan Peterson is a hammer. He’s become known for smashing through our culture’s penchant for “politically correct” ways of speaking, acting, and even thinking. The University of Toronto professor has risen to prominence over the past year-and-a-half by being plainly and earnestly outspoken with his opinions. His message, spread primarily (and quickly!) through YouTube, has resonated with many, especially those who have a more socially conservative worldview. Dr. Peterson might be most well-known for his stand against the possibility of government compelling people to use particular forms of speech, specifically in the case of gender pronouns. His YouTube videos have extended his voice beyond his U of T classrooms into the whole world. And his influence is now reaching beyond even his own efforts; Lindsay Shepherd, a teaching assistant at Wilfrid Laurier University, was recently censured by her supervisors for playing a clip from an interview with Dr. Peterson in her class. 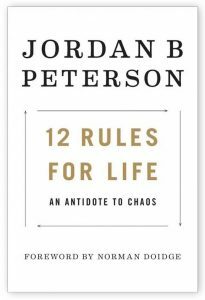 With all this in mind I was most interested to read Dr. Peterson’s new book, 12 Rules for Life: An Antidote to Chaos. While it sits on the Self-Help shelves at the bookstore, it might not be fair to characterize it so glibly. The book is an attempt to help people think deeply about how they act and what they say, and how those things work towards either the detriment or betterment of society. 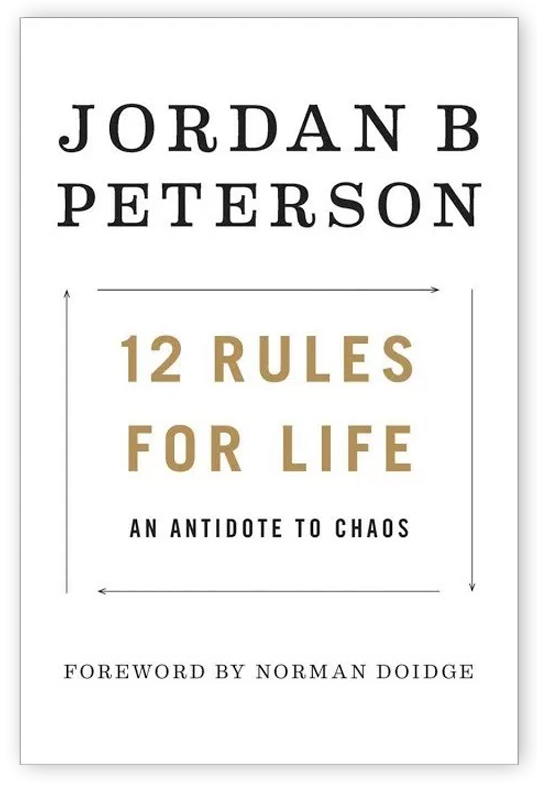 The book’s central premise is that chaos is something that needs to be overcome by moving towards order, and there are 12 simply-put (but not-so simply-lived) rules that will help people move from chaos to order in their own lives and in society. As such, it engages the topic of improvement with a much deeper foundation than does a more stereotypical self-help book. What is that deeper foundation? In lectures, interviews, and this book, Dr. Peterson freely and frequently draws upon the Bible. He sees much of our Western civilization as built upon the Bible and its principles. For him, this is a good thing, and he makes reference throughout his book to various passages and principles from the Scriptures. Which brings us to the problem of being a hammer: everything is a nail. Dr. Peterson is a clinical psychologist, and to him the Bible is but one more tool in the toolbox of clinical psychology. While he freely quotes the Bible, it doesn’t stand apart in any way from classic authors such as Goethe, Dostoyevsky, and T.S. Eliot, from famous psychologists and psychiatrists such as Jung, Nietzsche, and Freud, or even from other religious texts such as the Tao te Ching. For Dr. Peterson, the Bible exists alongside all other resources as simply one more that helps explain the human experience. He views it as a worthwhile resource, to be sure, but he doesn’t see it as the revealed Word of God; for him it is a humanly-developed case study of the entire human experience throughout evolutionary history. Maybe it shouldn’t be surprising that a clinical psychologist views the Bible this way, but, seeing that so many conservative Christians are attracted to what Dr. Peterson says, it is worthy of a cautionary note. A Christian will need to read 12 Rules for Life carefully. That would be true of anyone, because it’s a carefully thought out and carefully written book that deserves a thoughtful and careful read. And it is very much worth reading. But if read by someone without a solid theological foundation formed by the Scriptures as the revealed Word of God, it could also be a dangerous book. Space doesn’t permit us to go into detail about this danger here, so let’s use one example as an archetype (which, by the way, is one of Dr. Peterson’s favourite words and his primary description of Christ). One of Dr. Peterson’s rules is “pursue what is meaningful (not what is expedient)”. As general life advice goes, this is an excellent rule. What’s not excellent is how the Bible is used to expound it. In the chapter dedicated to this rule, Dr. Peterson uses the story of Adam and Eve to tell us that self-consciousness (the knowledge of Good and Evil) is what brings suffering into the world, because once we’re self-conscious enough to produce bad feelings in ourselves, we inevitably turn that awareness towards producing them in others. This is contrary to God’s Word in a number of ways, not the least of which is that rebellion against God’s perfect will is the source of suffering in the world, not the simple fact of man’s self-awareness. While there is much to be commended in Peterson’s book, and in his wider collection of content, Christians need to be wary of his approach to the Bible, which is actually more Gnostic and Gospel-reductionistic than Christian. But we can also see it as presenting opportunities. It’s an opportunity to be “Berean” in our approach (Acts 17:10–12) and compare the things we hear in our culture to the revealed Word of God. It’s also an opportunity to be reminded that we don’t live according to a set of rules, but in light of the Gospel. And it’s an opportunity to use the culture around us to point people to the true God revealed in Scripture: the One who gave His only Son for us, not as an archetype, but as a Saviour. Rev. Michael Schutz is pastor at Concordia Lutheran Church & School in Penticton, B.C., and writes at TheResonant.org.